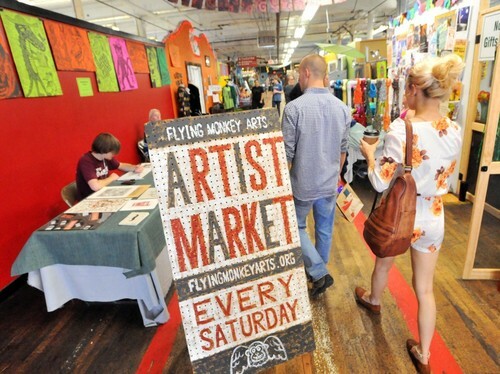 Local and homegrown since 2003, each Saturday you can stroll through our vibrant hall as Flying Monkey Artist Market vendors occupy the spaces between the diverse and eclectic studios of Flying Monkey resident artists on the second floor south of historic Lowe Mill A&E. Prepare to be amused, amazed, and delighted by Tennessee valley artists and craftsmen. Free to attend! Local and regional visiting artists are invited to set up a display of their work for sale. Interested artists please contact Cheryl at Karma Rags or call 256-468-5319 for set-up times, fees and guidelines to be considered for artist market participation.